I have always loved a good Sloppy Joe sandwich. 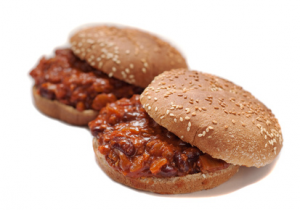 The other day it just seemed like a Sloppy Joe day to me, so I pulled out several recipes but none of them really appealed to me. I decided to take what I liked about each one and make my own recipe. Since I don’t eat meat, I have to substitute the meat with something else. Vegetable protein can be okay, but I didn’t have any and decided I would just use beans. 1. Beans help prevent heart disease. Beans contain a high quantity of phytochemicals which help keep your heart healthy. 2. Beans help prevent cancer. Beans contain a high concentration of cancer fighting chemicals called phytosterols and isoflavones. 3. Beans help lower cholesterol. Beans are high in fiber which is essential for good intestinal health. Fiber is also crucial in controlling cholesterol levels. Researchers found that 1/2 to 1 1/2 cups of beans provides about 10 grams of fiber. That is the same amount of fiber it takes to reduce cholesterol levels by about 10%. Beans also contain phytosterols and saponins which help reduce cholesterol. 4. Beans help with weight loss. Because of the high fiber content in beans, it takes your body longer to digest. This makes you feel full longer. The fiber in beans also causes your blood sugar to rise more slowly so you don’t get hungry as quickly and provides you with more energy. 5. Beans help manage diabetes. Because of the unique combination of protein and complex carbs, beans release glucose more slowly so that your body can adjust to the influx. This is preferable to the sudden rush of sugar that a diabetic experiences after eating a meal of simple carbohydrates. I hope you enjoy with recipe. As with any recipe, feel free to add or subtract the seasonings to your own taste. Saute the vegetables in olive oil until tender. Add the remaining ingredients and simmer for 20-30 minutes. Serve on a whole wheat (or grain) roll/bun to get your whole grains in.